Peapod “Happy Baby” classes provide you with the perfect opportunity to take part in a fun mix of storymassage, sensory and baby yoga sessions with your baby. Happy Baby classes are suitable from the age of 8 weeks to crawling. It’s an ideal follow on from baby massage class with mutual rewards to health and well being for you and your little one. Peapod “Happy Baby ” sessions combine a range of storymassage, baby yoga techniques and baby sensory. Each week we warm up with a little storymassage. Then we introduce your baby to dynamic and rhythmic movements which are perfect for nurturing and developing your baby’s ever-changing body. Finally we explore different sensory experiences such as lights,bubbles, parachute, scarves, ribbons and instruments. As with all of our peapodbaby classes the storymassage, sensory and movements are supported by lots of singing, music and interactive fun. Peapod “Happy Baby ” sessions offer your baby the chance to explore new sensory experiences and movement in many dimensions, including: facing forwards, backwards, upwards and downwards, all within a completely safe environment. 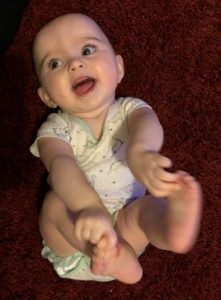 The movements have all been designed to work with the baby’s body systems and can help improve the digestive system, strengthen the immune system and help brain development just to name a few. The sessions are rounded off with some deep breathing relaxation exercises for parents and a short rejuvenating relaxation, then a chance for a chat and refreshments. There is a warm and friendly atmosphere in our classes . If at any point during the session you need to feed, change or walk around with your baby it is absolutely fine to do so. What are the benefits of “Happy Baby” classes? Happy Baby classes are suitable for babies from 8 weeks to crawling. Classes are small, friendly and relaxed. Anyone can join our “Happy Baby” sessions as no previous experience is necessary however, we do advise that both mother and baby have had their 6-8 week GP check-up before starting our Happy Baby classes. It’s advisable that mums do not participate in the exercises during their first 14 weeks of pregnancy as it involves some gentle exercise and lifting for mums. mums are advised to bring any usual items required for feeding and changing. We suggest wearing comfortable, non-restrictive clothing. All mats, equipment and refreshments are provided. Places are limited so please contact us for availability before booking. If classes are full we can add your name to our waiting list.